I need to do something to my hair urgently and I blame it all on my last hairdresser visit! Remember I wrote about spending a bomb on my hair right before my Tokyo trip? Actually, I did my hair on the very day of my flight, which was the reason we were late arriving at the airport. I also had a Guess the Price of my Hair contest, which was RM670 to get it straightened, coloured, treated and cut! The thing is I don't mind paying as high as RM1000 if you can guarantee me outcome that is smooth, straight and sleek. But right now, after merely five months of getting my hair makeover, my hair really doesn't look like I did anything to it. My rebonding and colouring, which were supposed to last me at least 6 months is almost completely and washed out. In fact, I noticed the colour was almost immediately gone after my first few washes and the thing I'm most upset about is that my hair is no longer super straight, which is how I like it to be. So now, after washing my own hair at home, I would have to use my own straightening iron to get it looking decent. As it is, my straightening iron is ancient and takes ages to heat up. And every time I wait for my iron to be ready for use, I end up angry thinking about the amount I spent on my hair for work that is shabby to say the least! So yes, I'm a little upset today and I'm thinking one of the new Cheap GHD Straighteners Online will hopefully cheer me up! I've already checked them out and I was thrilled to see so many types with all the cool features going for very cheap. I mean if I spent so much on my hair and it still didn't turn out the way I expected, I might as well get a cheap straightener as alternative! 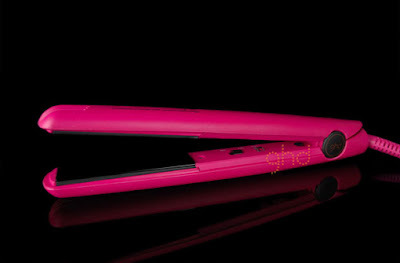 I kinda like this hot pink one and it's going for only £59 from the normal price of £115.59! What do you think? I love the smileys dearie.. esp the first one.. lol! I used to rebond my hair too and it last a long while.. but i did mine in Kimarie in Singapore lah.. it cost me about SGD300 for a a little bit over the shoulder length..
Why GG? I don like my hair colour oso… I mean from the last visit..
Ohhhhh straightener colour hahhahahaha! Oh no u no likey pinky, like Debbs she doesn like pink too LOL!!! Thanks for chopping GG, u zzzz edi or not? Yeah GG!!! U oso my TCM last month congrats but I haven updated badge…hang on hehehe! Wah wah wah GG, sure can get BF with ur new look, show me pic! Hahahaha why u no like pinky GG? Too girly for u is it? LOL! Yeah…. Ironic la GG! I love pink…he he yay for pinky MPG and TUO and Medical blog lol! LOL yeah la I read ur later comment then I know ha ha! I've heard of GHD straighteners, Marzie! I heard it's supposedly really really good. Last time we had a pretty good Vidal Sassoon hair straightener but my old friend borrowed it and never returned it. Thing is, my friend was a GUY!! LOL! Ha ha ha ha I feel like doing dat to mah hairdresser GG lol! Wats a gay thing GG??? hahahah yeaaahhh.. :) :) Or i'm thinking I get a new style over "there"! I'll ask my cuzzie to bring me! Yang ni, my guy friend punya hair takde lah curly mana.. just frizzy... pastu nak simpang panjang2.. LOL! Recent blog:=- Oh, The Shame! I guess you will look nice even not having a very straight hair. But RM670 for a hairdo is really expensive. Haha, Tekkaus, what kind of advice is this! Go bald first? gasp! Why? Why is everyone so preoccupied with straight hair? Does the iron for straightening the hair works? Does it damage the hair? Yalah, spent so much but did not get good results? That's really spoil your day right? It’s raining again here GG so cold…..